Today we compare two leading Magento 2 extensions that enhance the default shopping cart with the AJAX technology. 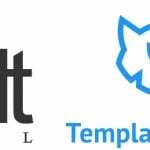 Both modules provide a different implementation of the same idea, so we want to figure out the core differences between Amasty AJAX Shopping Cart and Aheadworks AJAX Cart Pro. Below, you will find the comparison of the best Magento 2 AJAX add to cart extensions. Both Magento 2 AJAX shopping cart extensions have a set of specific backend settings. Although it is not the most critical part neither of Amasty AJAX Shopping Cart nor Aheadworks AJAX Cart Pro (since we want to emphasize the shopping experience first of all), backend settings can say a lot about the frontend appearance and functionality of the compared Magento 2 modules. So, what do Amasty and Aheadworks offer in this area? Amasty offers 4 sections of settings: General, Display Settings, Selling Options, and Visual Options. 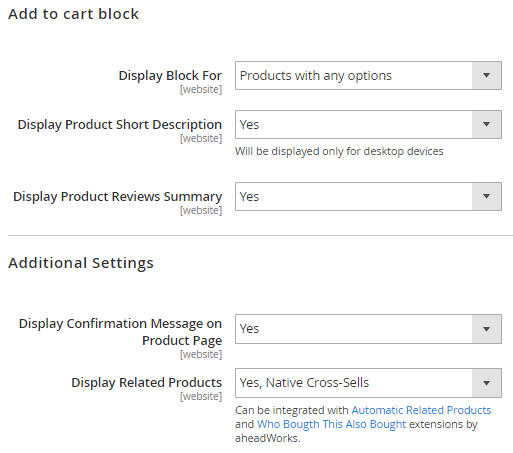 In case of the Aheadworks AJAX Cart Pro Magento 2 extension, there are only two sections: Add to Cart Block and Additional Settings. It’s already evident that the Amasty AJAX Shopping Cart Magento 2 module is more customizable, so let’s dive deep into the details. 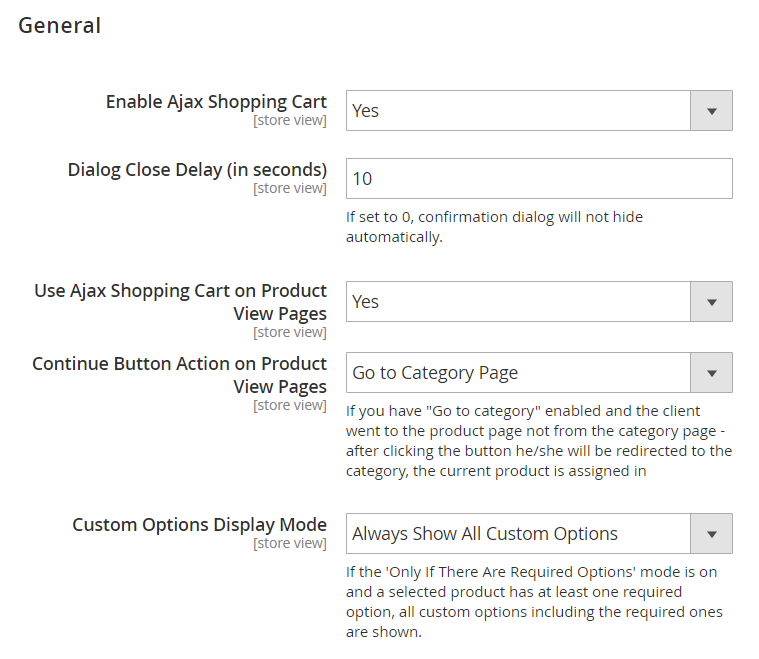 In the General settings, Amasty allows you to enable/disable the Magento 2 AJAX add to cart extension, specify a time interval after which the dialog window will be hidden automatically, enable/disable AJAX shopping cart on product view pages, set an action for the “Continue” button on product view pages, and choose a custom options display mode (for required options only or all custom options). 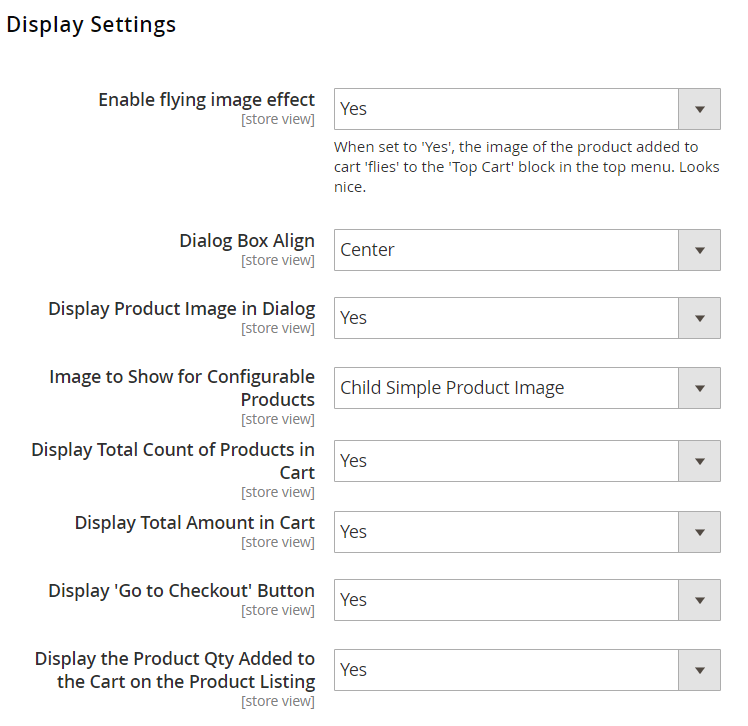 In Display Settings of the Magento 2 AJAX shopping cart extension, Amasty allows you to enable flying image effect, specify dialog box align, and choose whether to show/hide the following elements in a popup: product image, total count of products in cart, total amount in cart, and “Go to Checkout” button. Here you also decide which image to show for configurable products (child simple product image or parent configurable product image) and activate/deactivate display of the number of products added to a cart when a user hovers over a product. Next, you have Selling Options where the Magento 2 AJAX add to cart module enables you to show/hide related or cross-sell products for the AJAX dialog window. 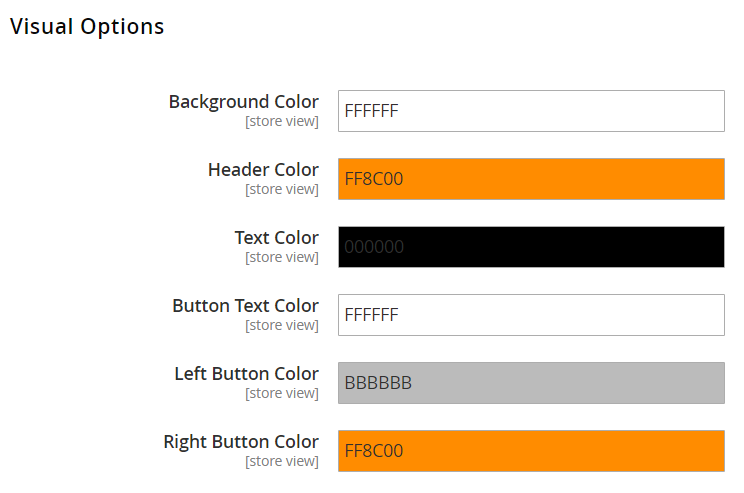 As for Visual Options, you can fully customize the color scheme of the Amasty AJAX Shopping Cart popup window. 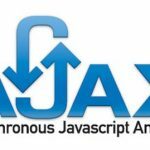 So, what about the Aheadworks AJAX Cart Pro Magento 2 extension? Which of the settings mentioned above does it provide? As mentioned above, the Magento 2 AJAX shopping cart extension configuration is divided into two sections. These sections contain only 5 options. First of all, you can decide whether to use the popup with all products or products with required options only. This unique feature is represented in the Aheadworks AJAX cart only (but in case of Amasty, you can customize which options to display). It makes shopping more convenient since it becomes faster to add products that don’t have required options without the popup. Why doesn’t Amasty have the same feature? Looking ahead, we should tell you that it is because of slightly different frontend implementation, but let’s return to the backend options. Next, the Aheadworks AJAX Cart Pro Magento 2 module allows you to show/hide product short description and reviews summary. Both features are not available in the Amasty’s solution, but the reason will be described below. As for the “Display Confirmation Message on Product Page” option, it seems that it fulfills the same role as Amasty’s “Use AJAX Shopping Cart on Product View Pages”. 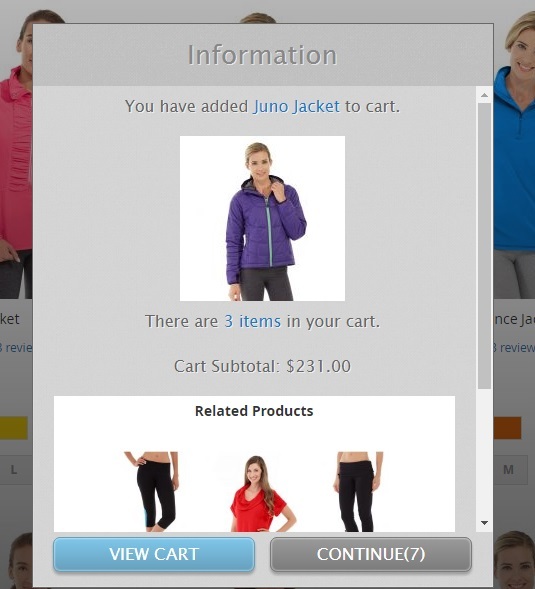 Also, both Magento 2 AJAX add to cart extensions provide the ability to display related products in the AJAX popup. As you can see, Amasty AJAX Shopping Cart provides more advanced backend customization than Aheadworks AJAX Cart Pro. Using the Amasty module, you can specify dialog close delay, customize various popup elements, and even create a unique color scheme for the dialog window. Let’s see what advantages are available on the frontend. Now, let’s compare the most critical aspect of both Magento 2 modules: the way they behave on the frontend. 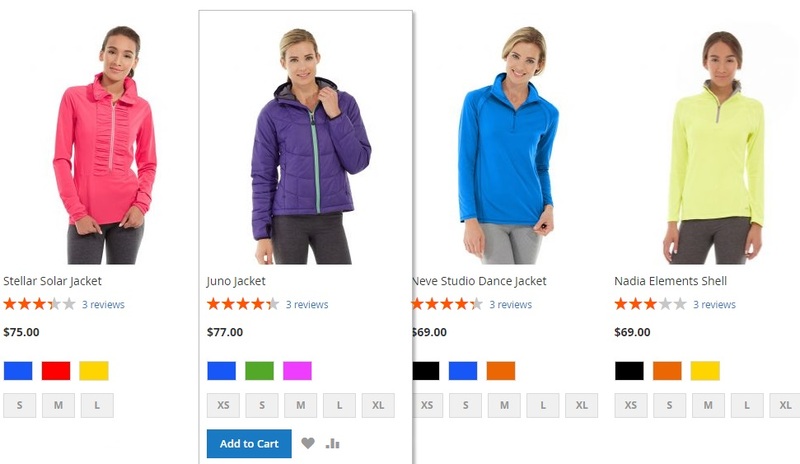 The aim of the two Magento 2 AJAX shopping cart extensions is to improve the default shopping experience by introducing the ability to add products to the cart right from the catalog page and proceed to checkout without visiting the cart page. The goal is reached in case of both Magento 2 AJAX add to cart extensions, but the way they work is entirely different. 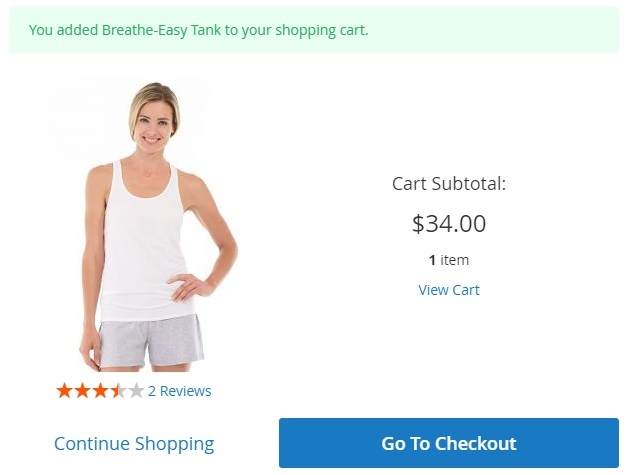 In case of Amasty, you hover over the product image, select necessary options, and then hit the “Add to Cart” button. The product is placed in the cart, and the confirmation window appears. The window shows the number of items in your cart and cart subtotal. You can continue shopping, view cart, or proceed to checkout. Also, note that the window is closed automatically (we’ve just specified the delay in settings). Related products are displayed here. A very straightforward approach, isn’t it? In case of the Aheadworks AJAX Cart Pro Magento 2 module, the popup is implemented in the form of a quick view window. 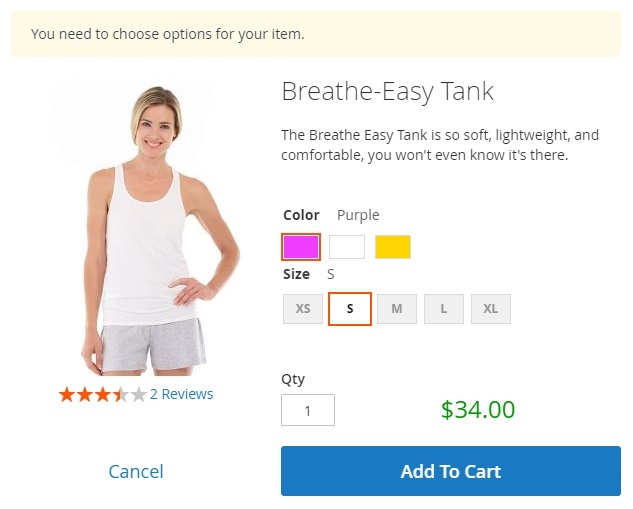 Although you can select product options right on a catalog page, they won’t be selected in the popup automatically, so you have to click the “Add to Cart” button. A new window appears where you should select a color, size, or other options. Short description and reviews summary are also shown here. Select necessary parameters and click “Add to Cart” once again. A new window is displayed. It also shows the number of products in the cart and its subtotal. You can go to the cart page, continue shopping, or proceed to checkout. Related products are shown in the bottom of the window, provided by this Magento 2 AJAX add to cart module. As for the price, it is almost similar: $199 for Amasty AJAX Shopping Cart and $219 for Aheadworks AJAX Cart Pro. As you can see, Aheadworks offers one extra step on the frontend which is the reason for the backend options described above. It doesn’t seem that this step makes shopping more convenient, but it allows providing a little more information about products on catalog pages. Moreover, the Magento 2 module has simple backend configuration. The Magento 2 AJAX add to cart extension has almost the same price as its competitor – $219 vs. $199, but if you are already an Aheadworks client, you can get it with a 50% discount. Although Amasty AJAX Shopping Cart costs less than Aheadworks AJAX Cart Pro, this Magento 2 module offers a more customizable tool with smoother frontend appearance. It doesn’t mean that Aheadworks has a much worse implementation, but Amasty seems to be a little bit better than the reliable and good Magento 2 AJAX Cart Pro extension.